The five precepts of the Church are meant to guarantee for the faithful the indispensable minimum in the spirit of prayer, the sacramental life, moral commitment and growth in love of God and neighbour. 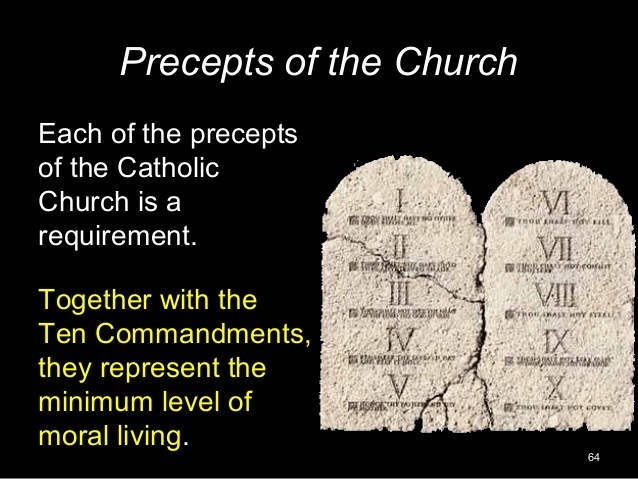 The first precept (“You shall attend Mass on Sundays and holy days of obligation.") requires the faithful to participate in the Eucharistic celebration when the Christian community gathers together on the day commemorating the Resurrection of the Lord. The second precept (“You shall confess your sins at least once a year.") ensures preparation for the Eucharist by the reception of the sacrament of reconciliation, which continues Baptism's work of conversion and forgiveness.